A British Ranger scouting out of Fort Detroit leaned against an old red oak. Warmed by a gentle May breeze, the seasoned woodsman wandered west in search of a wild turkey for supper. Darrel Lang, Lower Great Lakes near the River Raisin, 1760. 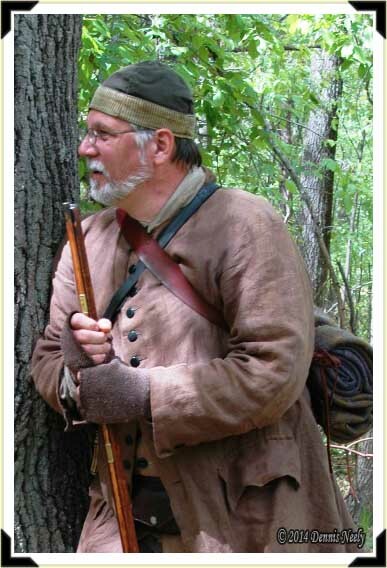 This entry was posted in Snapshot Saturday and tagged Dennis Neely, historical trekking, Mountain Man, Native captive, North West trade gun, Northwest trade gun, trade gun, traditional black powder, traditional black powder hunting, traditional blackpowder, traditional blackpowder hunting, Traditional camping, Traditional Woodsman. Bookmark the permalink.